At Ted R. Sanders, customer care and satisfaction is our primary goal. We make it our top priority to deliver efficient, worry-free moving at a very affordable price. Each move is planned and coordinated according to each individual’s needs. Being an Allied Van Lines agent since the late 1920s means that we’re experienced at moving…knowing the best and safest methods of transporting your belongings. We, at Ted R. Sanders Moving & Warehouse, pride ourselves in treating you as part of the family…caring for your items as if they were our own. If you want the best, you’ve come to the right place. Ted R. Sanders knows that a local move can be an exciting, yet sometimes unsettling experience. However, with us at your side, there is nothing to it! We would like to help you understand the way local moving changes are determined. We also want to ensure you receive an accurate estimate so there are no surprises on your moving day. If you have any questions before, during or after the estimate is provided, don’t hesitate to give us a call. When moving anywhere within the 50 states, Ted R. Sanders Moving & Warehouse acts as an agent for Allied Van Lines. With our 500 fellow agents, we are able to personally assist you with your relocation anywhere in the U.S. and around the world. While it is easy to say you will receive a quality move, we are the yardstick other movers use. 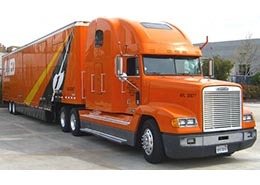 Allied Van Lines has employed the prestigious Gallup Poll to measure the quality of your move. Within two days of your delivery, a representative from Gallup will call you to get your impression of the move. Ted R. Sanders Moving has been rated Excellent for seven consecutive quarters with Allied International. This quality carries over when when we assist you with international relocations. Through Allied International, we have the capability to move you anywhere in the free world. From packing, to loading, to customs clearance…we handle it all.